WorldClassRoom FAQs - How do I view my final grades? In this tutorial you will learn how to locate your official, final grades, which are released electronically. Once the official, final grades are entered by your instructor, they will be visible in the Student Academic Services channel of the Connections portal. Instructors have one week from the end of the term to finish grading coursework and to submit final grades in Connections. If your grades are not available in Student Academic Services one week after the term ends, please contact the Online Learning Center at studyonline@webster.edu or 1-866-622-0888. To access your grades, login to your Connections account, then click on the Student link. 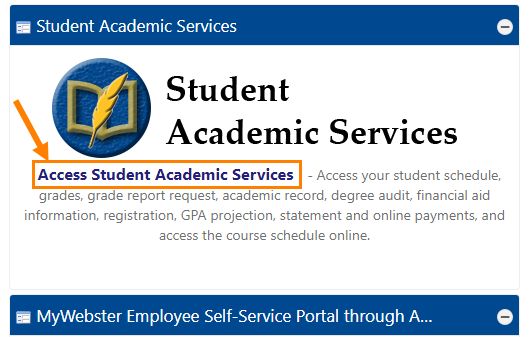 In the top middle portion of the page, you will see a channel called Student Academic Services. Click the first link which says Access Student Services. You may be prompted to re-enter your Connections username and password. Once logged in, click on the Grades link in the left-hand menu. Your grades will be displayed for the semester selected in the Current Options Settings box, so you may need to adjust your settings to the term you would like to view. Once set, you should see the courses you are registered in for the semester. If your instructor has not entered the official, final grade, there will be an IP (In Progress) in the Grade column. If you need a print out of your final grades once they have been entered by your instructor, you can use the Grade Report Request link in the left-hand menu. 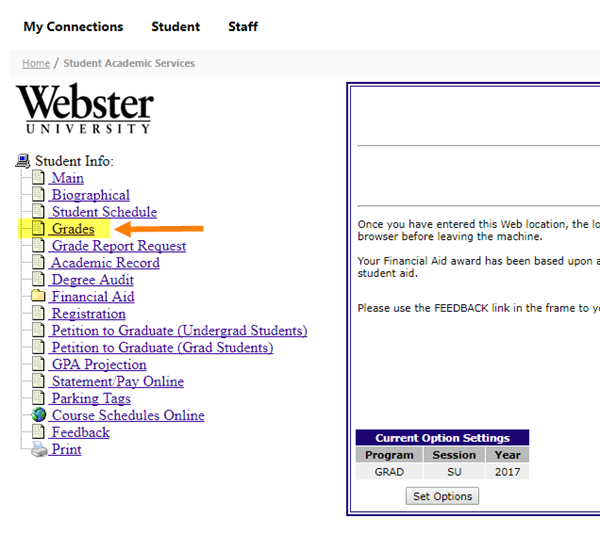 There, you can enter any address you would like for an official copy your grades to be mailed to, such as an employer. If you just would like a printout for your records, you can also print a copy of the Grades page. How do I access grades from the global navigation menu?